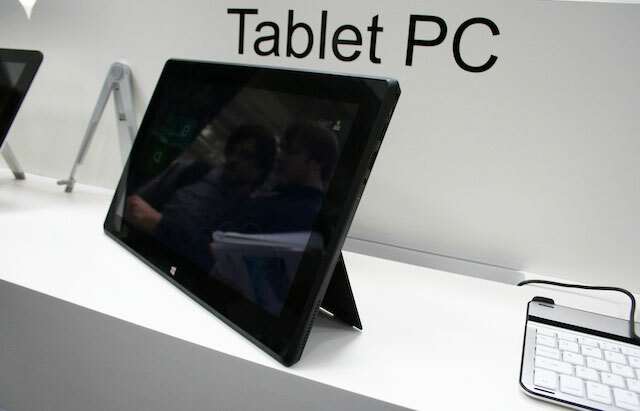 At CeBit this week HKC has unveiled a new Surface Pro clone tablet they have created which is a copy of Microsoft’s latest Windows 8 Surface Pro tablet, with a few changes to keep the price lower. The HKC Windows 8 tablet is fitted with a 13.3 inch, display, and is powered by a Intel Core i3 or i5 processor supported by 4GB of RAM. Watch the video after the jump to learn more about the Surface Pro clone and see it in action. The Surface Pro clone tablet is also equipped with a 2 megapixel front facing camera for video calling, together with a 5 megapixel rear facing for video and photographs. As well as a SIM card slot for data roaming, and a SD card reader with 2 x USB 2.0 port and a mini HDMI connection. For wholesale customers the Surface Pro clone tablet will cost you $350 each for the Core i3 edition, in quantities of 1,000 units.